Semko S.*, Pikul M., Voylenko O., Stakhovskyi O., Kononenko O., Vitruk Yu., Stakhovsky E.
Summary. Upper urinary tract urothelial carcinoma is a rare tumor. Data about its correct management are controversial. Investigational technology development made it possible to diagnose asymptomatic small tumors, which can be successfully managed endoscopically. 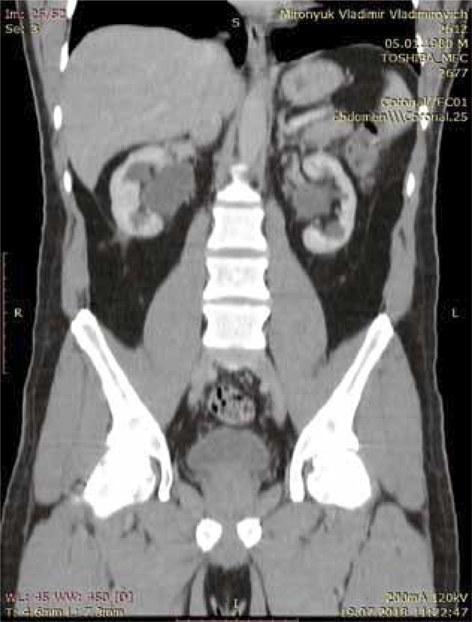 We report the case of bilateral urothelial cancer and hydronephrosis in patient aged 38. After management of acute post-renal kidney insufficiency, the neoadjuvant platinum-based chemotherapy was used followed by the kidney-sparing surgery split in two interventions on both sides. The patient does not have any relapse or further progression after one year of initial treatment with good performance status and high life quality level. We believe that the kidney preserving strategy can be considered as an option even in high-risk patients. The renal function in such cases is a crucial parameter affecting the outcome. Abbreviations used: eGFR — estimated glomerular filtration rate; RNU — radical nephroureterectomy; UTUC — upper urinary tract urothelial carcinoma. Upper urinary tract urothelial carcinoma (UTUC) is a rare tumor accounting for only 5–10% of all urothelial cancers, which is twice more common in the renal pelvis than in the ureter [1, 2]. Investigational technology development made it possible to diagnose asymptomatic small tumors, which can be successfully managed endoscopically. It should be noted that ureteroscopy and percutaneous nephron-sparing methods show good survival data. However, high local relapse rate remains a problem . Due to the fact that this method is suitable for a small cohort of patients, radical nephroureterectomy (RNU) with the removal of the ipsilateral bladder neck remains the gold standard of treatment . However, management with RNU predominantly leads to development of chronic renal failure. In case of disease progression, the possibility of conducting adjuvant chemotherapy is limited. Nowadays, the role of neoadjuvant chemotherapy is being dynamically overvalued which results in better oncological outcomes [5, 6]. This is mainly caused by the possibility to use efficient chemotherapy due to normal estimated glomerular filtration rate (eGFR) levels prior to surgery. Nevertheless, the problem of impaired renal function after surgery remains unresolved. 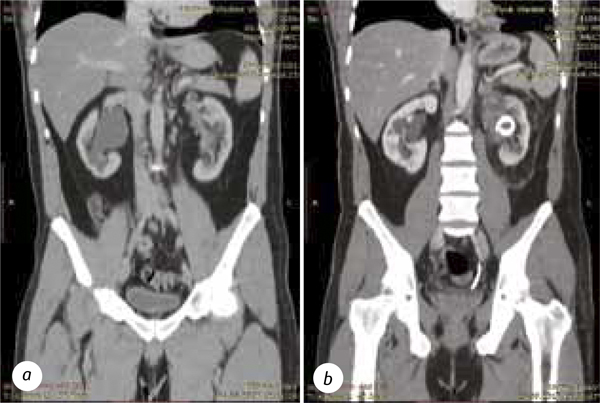 A 38-year-old man was first admitted to the Department of Plastic and Reconstructive Oncourology of the National Cancer Institute of Ukraine due to primarily diagnosed bilateral tumor of the renal pelvis accompanied by bilateral hydronephrosis. According to the ultrasound, the tumors in the pelvis of both kidneys were found, which were confirmed by computed tomo­graphy (CT) and magnetic resonance imaging (MRI) (Fig. 1, 2). The urine cytology verified urothelial carcinoma. Then the patient continued the treatment at the local hospital. On May 10, 2017, the patient noted the deterioration of general condition, anuria appearance. Because of the obstructive uropathy the local urologist conducted bilateral nephrostomy. After general condition improvement and serum creatinine decrease, the patient was referred to the National Cancer Institute of Ukraine. According to the CT data: upper calyx tumor on the left, sized 52 × 43 × 32 mm, lower calyx tumor on the right, sized 22 × 17 × 14 mm, bilateral hydronephrosis with pyelo-ureteral segment stenosis; parenchyma thickening to 12 mm on both sides (Fig. 1). Taking into account case complexity it was discussed by the multidisciplinary board that included medical oncologists, oncological urologists and radiologist. Considering the presence of bilateral lesions, high risk of perioperative development of acute renal failure, young age of the patient and increasing imminence of the left-sided RNU due to tumor size — the decision was to perform two courses of platinum-based neoadjuvant chemotherapy. It was also decided to avoid biopsy, eliminating possibility of impairing kidney function. Due to good performance status (ECOG — 1, CCI — 3), normal range of kidney function (eGFR = 85 ml/min/1.73 m2 (CKD-EPI)) with BSA (Mostseller) = 1.96 m2, the patient underwent two courses of platinum-based chemotherapy (Gem-Cist — days 1, 8, 15) with no serious adverse events. On September 4, 2017, the control CT was performed: according to the RECIST 1.1, regression on the left kidney tumor estimated 49%, the right — 28% (left side size — 27 × 24 × 23 mm, right — 16 × 10 × 12 mm (Fig. 2)). Considering good regression level, it was considered to proceed to surgery. On September 11, 2017, the left kidney sparing surgery was performed accompanied by Andersen — Hynes pyeloplasty and ureteral stenting. Pathological evaluation showed the glandular type of urothelial carcinoma G1, with negative resection margin and perinephric tissue — free from tumor growth. The drainages from the retroperitoneal space were removed on the 5th p/o day. On the 6th p/o day, the patient noted appearance of hyperthermia and pain in the left lumbar region. A CT scan was performed, according to which the left-side exudative pleuritis (Clavien — Dindo grade II) was revealed and was ma­naged conservatively. The patient was discharged home for rehabilitation. In one month after surgery, the ureteral stent was removed and on October 30, 2017, the surgery on the right kidney followed: lower calyx planar resection with pyeloplasty. Both surgical procedures were performed without the use of central ischemia to avoid acute kidney damage. Pathological evaluation showed muscle invasive urothelial carcinoma G2 with negative resection margin. Taking into account the result of pathology, multidisciplinary board decided to conduct two courses of the adjuvant platinum-based chemotherapy afterwards the surgery. As the eGFR levels were normal, with no performance status worsening, chemotherapy was equal to neoadjuvant and was well tolerated. Ureteral stent from the right side was removed 3 weeks after surgery. It was decided to plan investigational visits every 3 months during 2 years and then — yearly. After 3 and 6 post-treatment months — CT scans, cysto­scopy and urine cytology did not show any evidence of relapse or further progression (Fig. 3). Excretory urography was performed to assess upper urinary tract visualization 6 months after the surgery (Fig. 4). The patient regained his performance status (ECOG — 0, CCI — 3), eGFR level = 84 ml/min and life quality (according to SF-36). RNU with ipsilateral bladder cuff excision still remains the gold standard for the treatment of localized UTUC. With the instrumentation technology improvement, endoscopic management of UTUC has become feasible, although there still remains a high risk of recurrence after such surgery. Early experience with endoscopic management of UTUC has been limited to the patients with solitary kidneys, bilateral disease, or those who are not surgical candidates to undergo RNU. Data from these cases, though limited to retrospective, unmatched comparative studies, demonstrates no short and mid-term diffe­rence in overall and cancer-specific survival between endoscopic management and RNU . The incidence of bilateral UTUC ranges from 3% to 5% in different series and data about their correct management are controversial. Some authors even suggested bilateral RNU with the following hemodialysis as an option , which limits possibility of further chemo- or checkpoint inhibitor therapy in the future. According to European Association of Urology guidelines, the only indications for systematically offering nephron sparing treatment of high-risk UTUC include anatomically or functionally solitary kidneys, substantial renal insufficiency with the impending threat of hemodyalisis or bilateral UTUC . We believe that due to low kidney function and high need of combining systemic treatment with surgical management the role of organ preserving strategy can be crucial. In the presented clinical case, we have met with a complex problem, due to existence of bilateral urothelial cancer and hydronephrosis. UTUC was dia­gnosed due to the debut with anuria and the acute need in two-sided percutaneous nephrostomy. After management of acute post-renal kidney insufficiency, it was decided to use neoadjuvant platinum-based chemotherapy as an option, taking into account good performance status, eGFR level and high risk of nephr­ectomy on the left side. As the chemotherapy was well tolerated with excellent regression level, it was decided to split surgery into two interventions on both sides, starting from a more complex one on the left. Both interventions had no major perioperative complications (Clavien — Dindo grade II, managed conservatively) and preserved kidney units. Taking into account good functional outcome and kidney preservation, it was decided to administer adjuvant chemotherapy due to invasive tumor growth on pathology. Finally, the patient does not have any relapse or further progression after one year of initial treatment with good performance status and high life quality level. UTUC is a complex disease that is often followed by chronic kidney disease prior or after surgery. The clinical cases differ by their features and often need individual management strategy development. In the case presented, we focused on kidney function pre­servation due to his young age and feasibility of chemotherapy. The chosen strategy should avoid early cardiac disease development and postoperative need in dialysis. Nephrostomy prior to chemotherapy allowed not only to improve eGFR levels, but also raised accessibility of chemotherapeutic agents to tumor. Good regression levels made it possible to conduct organ-preserving surgery on both sides thus avoiding any major complications postoperatively. The kidney preserving strategy can be considered as an option not only in low-, but also high-risk patients. In our mind, in such cases, renal function is crucial and remains the main parameter that can influence outcomes. Survival levels of UTUC cohort suggest a need for further search of the ways to improve treatment results. The prevalence of bilateral UTUC is very low. The tumor characteristics and renal function are informative for decisions concerning treatment strategies. UTUC remains an aggressive disease with high progression levels. The role of organ-sparing surgery is still controversial, although kidney function preservation can be crucial and influence outcomes. Prospective multi-institutional studies and molecular research are required in the future. Siegel RL, Miller KD, Jemal A. Cancer Statistics, 2017. CA Cancer J Clin 2017; 67: 7–30. Soria F, Shariat SF, Lerner SP, et al. Epidemiology, diagnosis, preoperative evaluation and prognostic assessment of upper-tract urothelial carcinoma (UTUC). World J Urol 2017; 35: 379–87. Zigeuner R, Pummer K. Urothelial carcinoma of the upper urinary tract: surgical approach and prognostic factors. Eur Urol 2008; 53: 720–31. Margulis V, Shariat SF, Matin SF, et al. Outcomes of radical nephroureterectomy: a series from the Upper Tract Urothelial Carcinoma Collaboration. Cancer 2009; 115: 1224–33. Leow JJ, Martin-Doyle W, Fay AP, et al. A systematic review and meta-analysis of adjuvant and neoadjuvant chemotherapy for upper tract urothelial carcinoma. Eur Urol 2014; 66: 529–41. Hosogoe S, Hatakeyama S, Kusaka A, et al. Platinum-based neoadjuvant chemotherapy improves oncological outcomes in patients with locally advanced upper tract urothelial carcinoma. Eur Urol Focus 2018; 4: 946–53. Yakoubi R, Colin P, Seisen T, et al. Radical nephroureterectomy versus endoscopic procedures for the treatment of localised upper tract urothelial carcinoma: a meta-analysis and a systematic review of current evidence from comparative studies. Eur J Surg Oncol 2014; 40: 1629–34. Rouprêt M, Babjuk M, Compérat E, et al. European guidelines on upper tract urothelial carcinomas: 2013 update. Eur Urol 2013; 63: 1059–71.